Push the Button is rounded and accomplished where 2002's Come With Us was uneven and tentative. If you were worried that an unfocused fourth album was the beginning of diminishing returns for the pair, their fifth album serves as a reminder that the Chemical Brothers should never be underestimated. If it is easy to conclude -- in hindsight -- that 2001's Come With Us was something of a disappointment, it is a great relief to report that Push the Button represents a triumphant return to form for the Chemical Brothers. The same flabby mid-career languor that has marred the recent output of important artists like the Prodigy, Massive Attack and the Orb seems to have bypassed our boys. Rather, Push the Button seems to represent both a return to form and a bold reinvention, if such a thing is possible, effortlessly evoking the Brothers' greatest achievements while simultaneously striking out into tantalizing new directions. Since the release of 1995's Exit Planet Dust, the Chemical Brothers -- Tom Roland and Ed Simons -- have stood at the forefront of musical innovation. If this fact has been sometimes obscured by the loud and brassy nature of their singles, those who have listened with an open ear have come to recognize the Chems as perhaps the single most dexterous chameleons in modern music, in addition to being two of the most consistently underrated songwriters in any field of pop. The fact that neither of them sing and that their music has only sporadic relations with conventional instrumentation only makes it easier for trend-setting chauvinists to dismiss them. But if electronic music seems slightly gauche in the year 2005, it's no fault of the music itself. The Chemical Brothers stand as a solitary force in contemporary music, regardless of the vicissitudes of fashion. The problem with Come With Us was not that it lacked a handful of truly great tracks -- "Star Guitar", "It Began in Afrika" and "The Test" were all instant classics. The problem was that the rest of the album, the parts that fell between the driving singles, was somewhat unfocused. Whereas in the past every Chemical Brothers album had seemed to be an organic whole, Come With Us seemed strangely diffused, torn between strong dancefloor numbers and relatively emaciated stabs at more melodic material. Push the Button seems to have resolved this conflict merely through eliminating the stomping dancefloor hits that have defined so much of their past output. The overarching mood of this album -- notwithstanding two hip-hop numbers -- is melodic, and those who come looking for the same kind of monstrously powerful percussion that fueled "Afrika", "Hey Boy Hey Girl", and of course "Block Rockin' Beats" might be slightly disappointed. Which is not to say that the driving beats and powerful basslines are gone, merely that they have changed along with the Chems overall sound. More than anything else, the development of the Chems' sound has been the gradual refinement of a basic template. They're still making the same type of music they were a decade ago, still creating powerful pop music out of the intersections between disparate genres, but their frame of reference has seen geometric growth. In the beginning, the Chemical Brothers' most obvious influences, besides the acid house of their college years, were Public Enemy and Meat Beat Manifesto. This is how they defined their early "Big Beat" sound, by applying the techniques of musical collage, which had been refined by the production work of the Bomb Squad and Jack Dangers, to dance music. Sampling had been used in dance music since the very beginning, but never on such a wholesale basis. Half the fun of their early material came through in the interaction of multiple diffuse elements to create a kind of postmodern musical synthesis: a handful of eclectic noises artfully combined in order to create something much greater than the mere sum of its parts. But as their sound changed and grew, it also grew more streamlined. If 1997's Dig Your Own Hole was still clearly a product of synthesizers and samplers, 1999's Surrender was the first step towards something entirely different. The music was still electronic, the beats still heavy, but the end result was strangely organic. The Chems were still musical magpies, but their appropriation became increasingly subtle to the point of invisibility. What is more, they became interested in turning their malleable sound to the service of a series of remarkably canny musical pastiches. "Out of Control", featuring Bernard Sumner on vocals, sounded more like New Order than New Order had in quite some time. In a similar fashion, "Asleep From Day", with Hope Sandoval, was a better Mazzy Star track than the majority of Mazzy Star tracks had been. As enjoyable as these collaborations were, they also pointed to a potential Achilles heel in the Chems' admirably holistic approach. After the excellent Surrender, it would have been easy to imagine the pair becoming increasingly indebted to their collaborations, at the expense of their own unique style. Thankfully, Come With Us was surprisingly light on collaborations. But if their fourth album continued the trend towards an increasingly lean and organic sound, it also betrayed a startling indecisiveness. The album's singles were great, but the rest of the album seemed uncharacteristically undercooked. Beth Orton, whose career was practically built on the strength of her vocal cameos on the Chems' first two discs, turned in a limpid performance on "The State We're In". The psychedelic terrain of "Denmark" and "Pioneer Skies" seemed almost an afterthought: whereas these tracks could have served as the centerpieces of any past Chems album, they just weren't long enough to register as convincingly as they should have. The whole thing seemed slightly emaciated, as if it would have benefited from another 10 minutes of fat (how many albums can you say that about?). Push the Button is rounded and accomplished where Come With Us was uneven and tentative. This is the same Chemical Brothers that almost single-handedly bridged the gap between rock and dance back in the heady days of the "electronica" explosion. If you were worried that an unfocused fourth album was the beginning of diminishing returns for the pair, their fifth album serves as a reminder that the Chemical Brothers should never be underestimated. The album begins with "Galvanize", still not my favorite track, but definitely far more palatable in the context of the rest of the album than as a stand-alone single (my review of which can be found here). I think that a part of my initial disappointment might have stemmed from the fact that it was an unorthodox choice for a first single -- but having heard the complete album, I realize that the disc isn't about the kind of floor-filling DJ anthems that have historically been their bread-and-butter. Those impulses seem to have been shunted, for the time being, into their prodigious B-side output (as shown by the awesome slab of acid that is "Electronic Battle Weapon #7"). This album features more vocals than any previous Chems album, but the preponderance of vocal elements hardy detracts. Whereas in the past vocalists were utilized to evoke specific stylistic antecedents, such as New Order, Mazzy Star, and the Beatles, for the first time they seem to be utilizing vocals for their own purposes instead of merely in the service of well-crafted pastiche. Therefore "Galvanize" is the farthest thing from merely an A Tribe Called Quest homage: with it's deep bass hits and powerful drums, it doesn't really have any precedent in modern hip-hop. Tim Burgess returns on "The Boxer", having last worked with the duo on Exit Planet Dust's "Life Is Sweet". It's an odd track built on a ramshackle, slightly off-tempo piano sample set above a loping mid-tempo rhythm. It doesn't really sound like anything I've ever heard before: it's strangely syncopated and slightly light-headed. I wouldn't be surprised if it was the next single, because its not the kind of track you forget. "Believe" is the first of two tracks which seem to be at least partially indebted to late '70s/early '80s funk, featuring greasy guitar riffs over a floor-rattling house beat. Kele Okereke's repetitive vocal, in addition to the stomping beat, mark this as another possible single, and one of the album's best chances for dancefloor success. "Hold Tight London" is an early favorite, and a singular example of the Chems' unique approach to melodic songwriting. The track is built on a shuffling Soca-influenced house beat, with additional percussion provided by Jon Brookes of The Charlatans UK. The minor-key melody sneaks in as a syncopated element of the beat, building in complexity until the song's entire movement reveals itself in the mellow crackle of an electric guitar. Anne-Lynne Williams provides the voice, providing an already melancholy track with a truly affecting heart and soul. "Come Inside" is the album's second funk-influenced number, with a bass-heavy rhythm that seems at least partially influenced by Liquid Liquid's oft-sampled "Cavern". This track has one of the most pummeling beats the duo have ever recorded, offset against the preternaturally funky baseline. Those who may by now be wondering where the duo's traditional "Big Beats" are hiding need look no further than "The Big Jump", a slightly goofy guitar-driven rock track strongly reminiscent of Death in Vegas' "Dirt". The album's second hip-hop track is "Left Right", featuring Anwar Superstar (who is, incidentally, Mod Def's brother). Surprisingly, given the apolitical nature of the Chems's oeuvre to date, its touches on recent politics and international affairs. It also seems slightly influenced by late '90s Southern-style "bounce" hip-hop, particularly the jagged synthetic percussion of early Cash Money and mid-era No Limit. I don't think that Anwar is probably anywhere near as talented as his brother, at least based on the evidence of this track, but he does offer an interesting, forcefully rhythmical style that serves as a fierce counterpoint to Q-Tip's smooth flow. However, Anwar's repetitious usage of the hoary "ghetto soldier" metaphor adds unfortunate weight to the unlikely Master P comparison. "Close Your Eyes" is another highlight. The Chems here present a new British group, The Magic Numbers, for our consideration, and I must say this is certainly an impressive debut. It would seem that working with the Flaming Lips on 2003's "The Golden Path" (off their Singles 1993-2003 compilation) inspired the Chems to attempt a bit of their own indie-rock psychedelia. They've succeeded, as this is certainly the best Flaming Lips track that the Flaming Lips never recorded, with perhaps a bit of Mercury Rev's resplendent melancholy thrown in for good measure. It's easy to imagine quite a few indie rockers being surprised by this track. It's beautifully melodic, effortlessly catchy and perfect for college-radio mix CD's: if you needed more proof that the Chemical Brothers are still one of the most diverse and ambitious pop groups around, here it is. "Shake Break Bounce" is another welcome flashback, a funky breakbeat track that brings to mind the Chems good friend Norman Cook, AKA Fatboy Slim. There's a frenetic bongo beat set against a softly strumming Spanish guitar, and effect which produces an oddly anxious mood. It acts as something of a palette cleanser before the album's final movement, beginning with "Marvo Ging". The track starts with a backwards steel-guitar loop, gradually giving way to a mid-tempo rock beat and gentle glockenspiel. It reminds me a lot of the title track to Surrender, another unique hybrid of acoustic instrumentation and electronic rhythms. "Ging" eventually gives way to "Surface to Air", which serves as a fitting climax to a stridently peripatetic album. It is almost reminiscent of Orbital, building slowly from a quiet synthesizer pulse, gradually adding extra additional elements until it reaches an irresistible crescendo. The song is built around a numinous guitar melody which could have been cribbed directly off Power, Corruption & Lie -- but while the track is perhaps informed by half-a-dozen influences, it is steadfastly unique, the kind of multi-faceted and trancsendant musical narrative that the Chemical Brothers create so effortlessly. The Chems have always made a habit of taking the best bits from the music that inspired them and making them their own, synthesizing new forms from seemingly antithetical paradigms such as acid house and Brit-pop, or hip-hop and indie-rock. Although they've gotten better at streamlining this synthesis, they still betray their hand occasionally, such as their proclivity towards Sgt. Pepper-esque psychedelic crescendos which marks tracks like "Marvo Ging" and "Surface to Air". 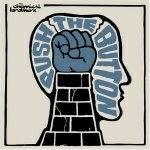 Push the Button reaffirms the Chemical Brothers' status as the premiere group in electronic music. They weren't the first electronic group to consistently record indelible albums, and certainly there are any number of acts currently recording who possess enough raw talent to go measure-for-measure with Tom and Ed any day of the week -- the Basement Jaxx, Underworld, DJ Shadow, Orbital (before they retired). But the Chemical Brothers possess a kind of understated gravitas that can only come with a strident disregard for the vagaries of fashion. There are few genres as slavishly devoted to fashion as electronic music, and it is to their credit that while the Chems' may occasionally reference the sound of the moment, they remain diligently apart from the mainstream. They are now, as they have always been, sui generis, resolutely unique and consistently innovative. The Chemical Brothers have overcome whatever temporary malaise they suffered on 2002's Come With Us and have successfully redefined their sound for a new era. Although its not a perfect album, the understated diversity of Push the Button has the potential to open up the group to an entirely new generation of fans. Although it may have seemed unlikely in 1997, the Chemical Brothers have crafted an album whose melodies are for more memorable than its beats. Its a natural progression, just another step in the Brothers' ongoing evolution, an incremental process which has hopefully just begun.